WHAT IS AMERICA RUNS 5K? America Runs 5K (AR5K) is a 15-day virtual race event organized by Charity Footprints, Inc. in which Patrons join a non-profit's team to complete a 5K challenge and raise funds for the non-profit. Free Peer-to-Peer Fundraising: Each AR5K participant gets a personal fundraising page to rally support & raise funds from their friends, family and loved ones. Participants can amplify this support by requesting matching donations from their employers, sharing their workouts on social networks, and engaging with non-profits by volunteering after the challenge is over. Peer-to-peer fundraising is completely free for the first $1,000. Our standard 4% platform fees + (2.6% + $0.30) credit card transaction fees apply after that. 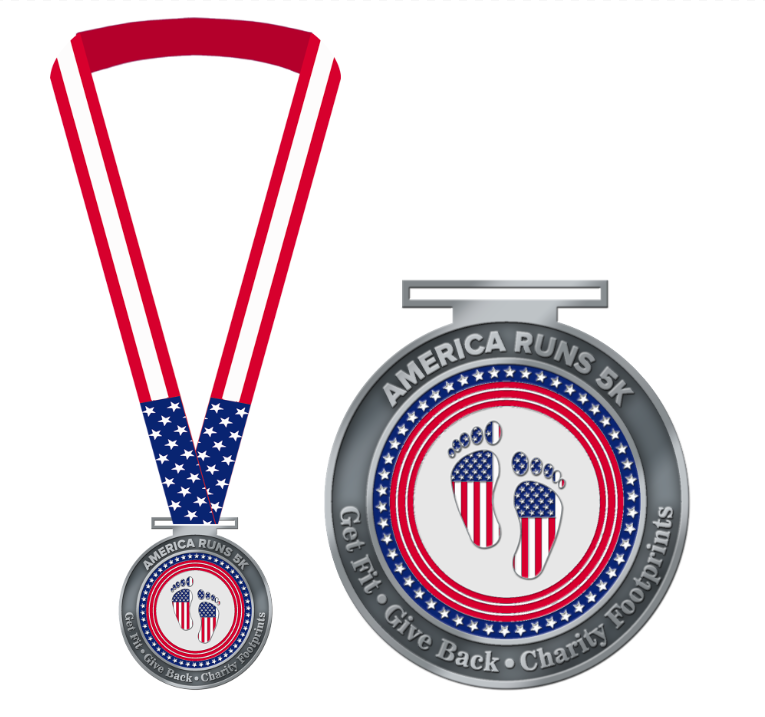 Swag ‘n More: Each participant who completes at least a 5K (total workout distance over 15 days) receives a beautifully crafted 3" America Runs 5K race medal. Registration Fee: Participants can join a non-profit's team by paying a $20 registration fee. Out of each registration, non-profit earns $10. Join a non-profit team you want to support. Run, Walk, Ride from Jan 16-30th and complete 5K to earn the medal. Share your page on social media to fundraise (optional). We'll ship out race medals (track at least 5 Km). * Standard Charity Footprints’ fundraising charges apply (4% + credit card fee of 2.6% + 30 cents per transaction) over $1,000 in total fundraising. Fundraising fees + Transaction fees are waived off for first $1000 fundraising for non-profit in this campaign. Charity Footprints donates $10 to the non-profit out of the registration fee for AR5K. Campaign registration fee is the amount that participants pay to enroll in this fitness challenge. The registration fee for America Runs 5K is $20. Well, you won't have to create a separate fundraising page. Once you register for this campaign, we'll give you the link to your individual fundraising page, that is directly linked to your selected non-profit. After registration, download the Charity Footprints' iOS or Android app and track your workouts toward this campaign. Please note that you should use the same login credentials that you've used to register for this challenge. Anyone! The fundraising research shows that the number one reason for people not donating is that they weren't asked to. Ask and thou' shalt get, perhaps :-). There are things you can do to attract people to sponsor you. Consider adding a picture to your fundraising page, telling potential donors why this cause is so personal and important to you, sharing your fundraising page on social media, email, and chat groups. You can contact us any time you need help. We love hearing from participants so please don't hesitate to write to us about any issues you are facing, any suggestions you have, or just to say hi.